If you’re looking for ideas on ways to upgrade your bathroom, look no further! 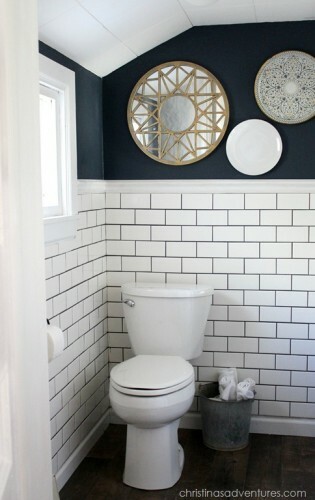 Here are some of my favorite bathroom makeovers with detailed steps on how each project was done. The photos alone will give you great ideas on what kind of bathroom makeover you can do in your home. Bring on the eye candy! You will see that most of these bathrooms are white. White means clean, sanitary, and what is what we want in a bathroom right? Make sure you add some natural colors to warm up the room. 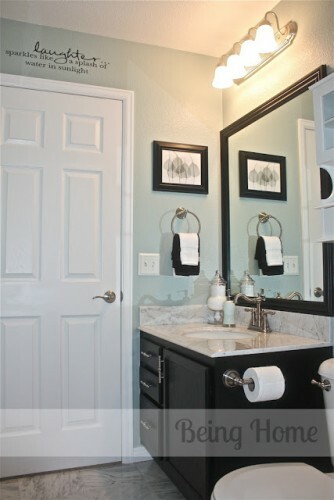 If you use a blue make sure it is a warm blue, or you you will end up with a very color looking bathroom. 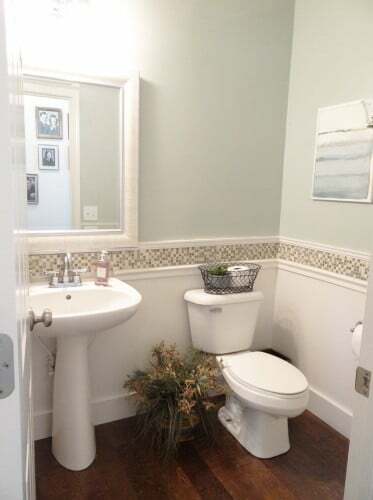 Plants are great additions to bathrooms. They improve the air quality and always look beautiful against white. Stain an standard bathroom a deep walnut color and you instantly have an upgrade. This dark wood is beautiful! I am in love with the farmhouse look, and though I live in the city my house is slowly become the interior of a farm house. 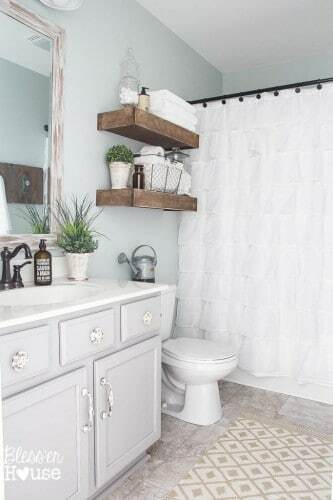 Lots of white, green and natural woods make this bathroom beautiful. 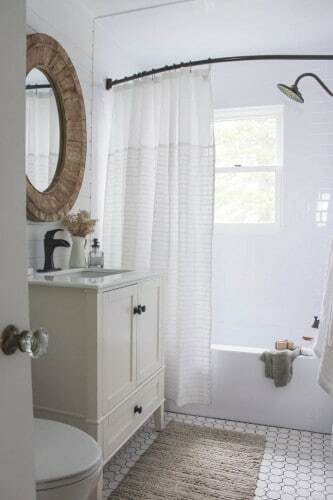 I love a cloth shower curtain as it give the room the much needed soft texture. 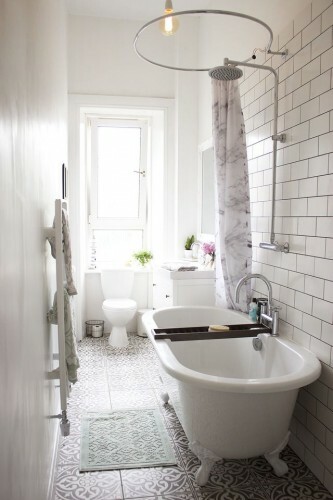 Tiled walls in a bathroom makeover is a very natural look. I love how the paint of the wall matches the grout of the tile. This gray is my favorite color! It is a deep blue gray, and with silver accents it is simply gorgeous! If you are painting your cupboards make sure you have a lot of white to offset the color. Do you have a small bathroom? If so avoid dark colors, use only light colors to make it appear larger than it is. If you have a small budget, check out this link! 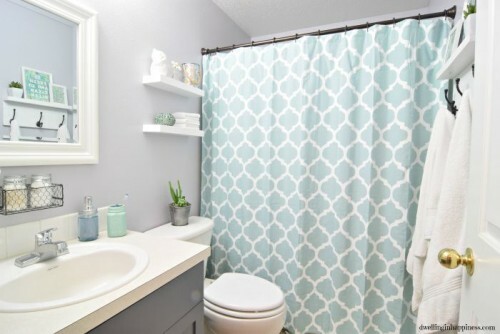 Multiple shades of one color such as this blue bathroom only works if you have a lot of white. 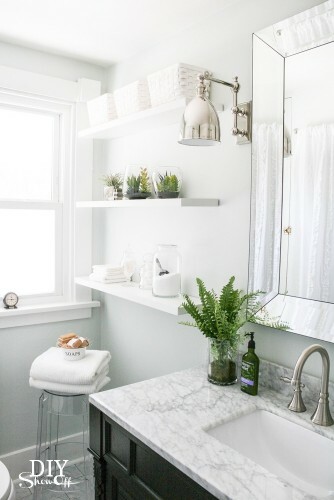 White shelves, mirror frame, counter tops, doors, and even towel help make this room a success. I love this sink! 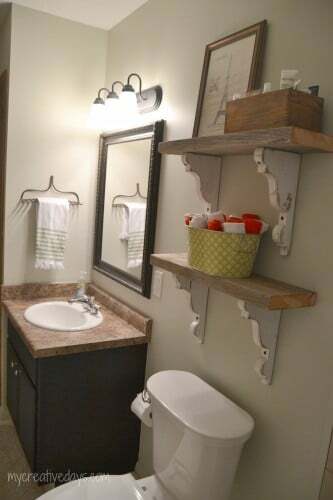 If you don’t have space to spare get rid of your large cupboard sink and install a smaller sink. Shelves on the wall can replace the storage you lost. 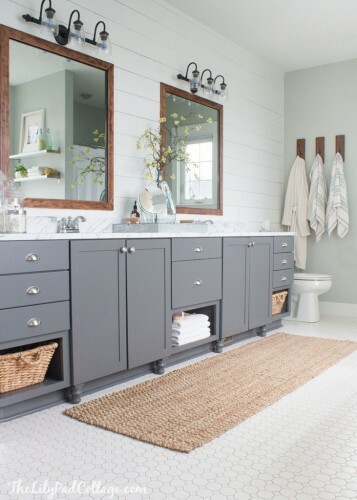 No matter what bathroom makeover you are looking for I hope you found some great ideas here. Thanks for stopping by! Bedroom Makeover Ideas for You!